From modest beginnings War Horse has become a part of contemporary culture, a story from a century past that speaks to that which matters to the world right now. The journey begins on the cusp of WWI, as an English farming family buys a fiery hunter colt at auction despite not having the funds to pay for him. Named Joey, the horse seems to be nothing but a loss for struggling Ted and Rosie Narracott, but their son Albert is determined to tame and train him, making the most of Joey’s enthralling spirit, speed and affection. The two are inseparable, but when war breaks out, they are pulled apart as Joey is sold from under him and heads to the front as the mount of a dashing British cavalry officer. It first became a well-loved family book in 1982, then an innovative stage play that still takes audiences by storm, saw another incarnation in its most visceral medium yet when it was was adapted into film, and on November 7, 2015, by special invitation, award-winning Sherborne Abbey Festival has arranged for National Theatre puppeteers and the magnificent life-size horse ‘Joey’ to make a guest appearance at the performance of War Horse Only Remembered at Sherborne Abbey, with author Michael Morpurgo reading the powerful and deeply-moving story of young Albert and his beloved horse Joey, joined by acclaimed musicians John Tams and Barry Coope, who accompany him with the rousing yet haunting songs specially composed by John Tams. 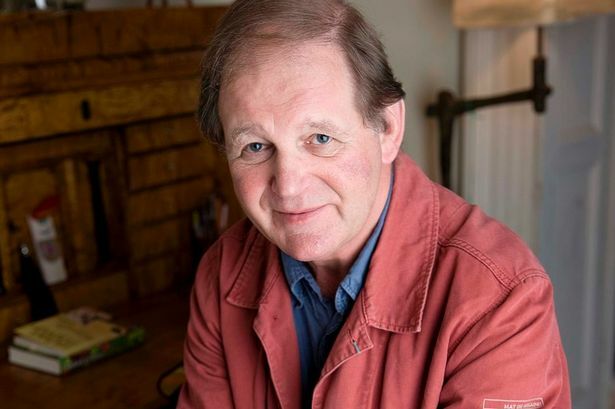 It all started with novelist and children’s author Michael Morpurgo, who always wanted to write a tale set against the Great War. World War I is perhaps the least talked-about conflict of the 20th century, leaving in its wake a world forever changed and a generation tasked to rebuild from ashes. For a long time Morpurgo had looked for an original way to write about the war. But it wasn’t until he met an aged veteran in a bar that he found his way in–inspiration sparked when he heard the man talk with passion not about his fellow soldiers but about the incredibly heroic horses with whom he served. Like most people, Morpurgo had never given much thought to horses in wartime, but this old soldier opened his eyes to a vast, unexplored world: the bonds between humans and animals that even battle could not tear asunder, and that kept so many going when they might have given up. “Here I was listening to this old man who had tears in his eyes talking about a relationship he had with a horse on the Western Front decades ago,” the novelist recalls. “I learned that these horses were doing so much more than simply carrying soldiers or gun carriages. They deeply mattered to people.” That initial conversation led Morpurgo into his own personal hunt for research, in which he discovered that a remarkable 1 million horses valiantly went into battle with the British during WWI and only 62,000 animals returned. He learned how vital horses were on all sides of the war, giving soldiers from every country an invisible but common thread. He explored poignant paintings and read historical accounts of how horses sacrificed, suffered and committed acts of bravery–just like their human companions. Through it all, he felt this was a story that needed to be told. Published in 1982 as a story for young adults, the book was quickly embraced by readers around the world and was a runner-up for the prestigious Whitbread Award. In 2007, when the novel was adapted into a mesmerizing stage play at London’s National Theatre by Nick Stafford, audiences went mad for it and for its themes of human-animal friendship, the power of endurance and the way hope for the future stays with us when all appears lost. When Spielberg took on the project, Morpurgo could hardly believe it. He was thrilled with the direction, which was as unique to the screen as the theater version was to its form. “There was an incredible meeting of minds with Steven. We’re both storytellers who are fascinated by how stories can expand and grow. Steven told the story in his own way, with more depth and breadth,” says the author. The filmmakers next turned their attention to adapting the novel. First they brought in British screenwriter Lee Hall, who wrote the triumphant Billy Elliot, and then, to add more layers, they brought in another Brit, Richard Curtis, whose films include Love Actually, Four Weddings and a Funeral and Notting Hill as well as the TV series Blackadder, a comedy set in the trenches of World War I.
Curtis notes that the story has a strong connection to the world right now. “With the financial recession, and the threat of terrorism, that question of how individuals survive in a big dangerous world is something that we are all more aware of right now,” he notes. As he discussed the nuances of the screenplay with Spielberg, Curtis also was put in mind of another subtle influence. “I think somewhere in Steven’s mind was the cinematic tradition of the Western. You start out in a lovely homestead where they’re pulling the water and there’s a friendly goose, and then suddenly there’s the foreboding sense that something bad is coming just over the horizon,” he observes. When the darkness of war arrives in Devon, the resulting chaos cleaves Albert and Joey apart, but Spielberg and Curtis discussed coming up with a narrative device to tie the two friends together even as they each go off on disparate adventures. This became the pennant Albert ties to Joey’s reins the day he leaves his side. How do you unfold a world-wandering tale of love, war, fortitude and hope when your main character is an innocent village colt in search of kindness, friendship and a way home? That challenge instantly compelled Steven Spielberg when he encountered Michael Morpurgo’s novel “War Horse.” The book presented an inspiring legend, but it was cut from a different cloth than most. All manner of stories have emerged from war–stories of romance, of heroism, of moral dilemmas, of divided families transcending hardship. But here was a story of wartime as it had never been experienced: through the journey of an animal propelled into battle with no malice or side to take, fueled only by the burning desire to live and return to the ones he loves. To do the story justice would be a creative and technical feat, one that hooked into Spielberg’s penchant for chronicling the human condition. It was one that, for all its scope, would have little to do with special effects and everything to do with a more hand-crafted cinematic style, working humanely and intelligently with remarkable animals and engaging human performances, and guiding a devoted crew to overlay a triumph of the spirit atop an unforgettably rugged landscape of conflict. “War Horse” is about classical movie storytelling, weaving a chain of individual stories into an intricate canvas portraying the power of hope in the toughest of times. The novel had been told with the simple power of allegory. The play, which Spielberg first saw in London at the urging of his long-time producer Kathleen Kennedy (who has produced four decades worth of Spielberg’s seminal films), was emotionally transporting with its whimsical use of towering yet bare-boned horse puppets. But Spielberg immediately understood he would have to find his own visual path to bring the story fully alive on the screen. He took off at a galloping pace. Following a different track, Spielberg envisioned the film emerging from the tradition of the odyssey–the mythic journey that propels a youthful hero into the dangerous world only to return with hard-won wisdom and a fresh view of life. Only this time, the traveler would have the perspective of a different species silently, yet soulfully, witnessing humanity at its most troubled yet inspirational. Structurally, the film became a study in shifting moods that lead into one another–the rough-hewn, almost storybook village of Joey’s youth gives way to the shock and adrenaline rush of a brave new mechanized battlefield, which gives way to an idyllic French farm full of pastoral pleasures, which unravels into the pandemonium of the trenches and the desolate mists of No Man’s Land, all of which only reinforces the driving memory of the village where Joey’s journey began, and to which he strives to return. Courage is what keeps Joey and Albert going through four danger-filled years apart, and it is courage that becomes a theme woven through the entire texture and fabric of the film. “I think ‘War Horse’ has a lot to say about courage–and about doing things not just for yourself but for the sake of those you love. That theme comes through in many different ways,” Spielberg notes. Another source of fascination for Spielberg in the story are the mysteries of the powerful human bond with nature. He himself lives with horses and has seen firsthand how close they can get to their human companions. Now, he wanted to expose the hearts of horses as they had not been seen on screen before–in all their pure, primal feeling and nobility. Known as the Great War, WWI was fought between July 1914 and November 1918 as the delicate balance of power between European empires fell apart. The Allies (Britain, France, Russia, Belgium, Serbia, Italy, Japan, Greece) fought the Central Powers (Germany, Austrio-Hungary, The Ottoman Empire). The U.S. entered the war in 1917 on the Allies’ side. It was the first war in history to be fought on three continents. It was the first war to use automatic artillery, mustard gas and mechanized tanks. 9.7 million soldiers and 6.7 million civilians were killed worldwide in four years of war. More than 200,000 men perished in the trenches of the Western Front. The war introduced unprecedented use of animals in warfare, including millions of horses and hundreds of thousands of dogs. It was the last war to feature major cavalry charges, but with the arrival of automatic artillery and trench warfare, the use of cavalry became rare, and horses were used more as “beasts of burden” in rough terrain. WWI was later called “the war to end all wars” because it seemed impossible that such a devastating event would ever be repeated. When war was declared in Britain in August of 1914, most of the populace believed it would last a few weeks or months at most and all the men would be home by Christmas. Most soldiers who fought in the war were between ages 17 and 40, although many lied about their ages to join up. The Western Front of the war was a line of trenches that crossed Europe, from the Belgian coast to the Swiss border, passing through much of France, where infamous battles were fought at Ypres, Verdun and the Somme. After an armistice was signed in 1918, troops began to withdraw from the Western Front. Surviving soldiers and horses, like Albert and Joey, headed back to their villages and to a world changed forever, carrying the hope for a lasting peace. Throughout human history, animals have accompanied soldiers into battle, their natural, wild instincts recruited to serve human aims. The first mounted cavalries appeared by 1000 BC in Assyria, the great conqueror Hannibal traveled with a phalanx of armored elephants and the Roman Empire trained “war pigs” whose ferocity was legend. But it was during WWI that literally millions of animals became an integral part of military operations–living, dying and surviving right next to the young soldiers, many of whom had left behind beloved pets and farm animals, on the battlefields. Yet for the soldiers, the horses that kept going day after day became a great source of solace and inspiration. Those who rode or worked with horses bonded deeply with their charges, moved by the animals’ stoic work ethic and willingness to attempt the most unimaginable feats without complaint. Today, few military organizations utilize horses in battle (save for the Sudan’s Janjaweed), though cities the world over maintain the war horse’s ancestors: mounted police forces. While the individual horses that gave so much of themselves in WWI will never be known, appreciation has grown of horses’ wartime sacrifices as more people learn about them. In 2004, the Animals in War memorial opened in London’s Hyde Park, including the bronze sculpture of a lone, noble horse staring off into the distance.